Associated Independent Recording (AIR) is an independent recording company founded in London in 1965 by Beatles producer Sir George Martin and his partner John Burgess after their departure from Parlophone. The leading independent recording studio complex was founded in 1969. Since then, AIR has operated its own professional audio recording facilities, Air Studios. AIR's first facility opened on 6 October 1970. It was located on the fourth floor of 214 Oxford Street, containing four studios, and later a MIDI programming room. The facility included two large studios (one 58×32 feet, the other 30×28 feet) and two small ones. The studios contained two Bösendorfer pianos, many soundproof booths, and a 56-channel mixing console, custom-designed by Neve to AIR's specification. "Recently refurbished control room now featuring 60 channels by SSL with automation and TR and 12 fully integrated channels by Rupert Neve of Focusrite, two 32track Mitsubishi X850 digital machines and 24track Studer A800. Digital mixing on two Mitsubishi X86. Very comprehensive ancillary equipment list." Jimmy Buffett recorded Volcano at the Montserrat studio in May 1979, naming the album and its title song for the then dormant Soufrière Hills volcano on the island. Elton John recorded three albums at the Montserrat studio in the 1980s. Dire Straits recorded their successful Brothers in Arms album between 1984 and 1985. Other artists such as Ultravox, Orchestral Manoeuvres in the Dark (Pre-recorded Junk Culture), Paul McCartney, Marvin Gaye, Rush, the Police (Ghost in the Machine and Synchronicity), the Rolling Stones, Black Sabbath, Midge Ure, Little River Band, Duran Duran, Sheena Easton and Luther Vandross have also recorded albums there. The first album cut in the newly opened studios was Real to Reel by the Climax Blues Band in 1979. 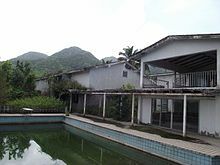 In 1989, Hurricane Hugo devastated the island and the Montserrat facility was severely damaged and was forced to close. The buildings are still standing but their roofs are failing, leading to extensive damage to the floors of the accommodation area and inner part of the studio complex making them unsafe to walk on. The facility is now a modern ruin, and is closed to the public. The buildings are located at 16°44′28″N 62°12′53″W﻿ / ﻿16.74111°N 62.21472°W﻿ / 16.74111; -62.21472. 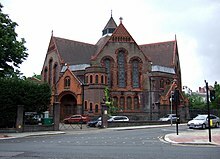 In 1991, with the lease on the Oxford Street premises coming to an end, AIR Studios took over Lyndhurst Road Congregational Church, a Grade II listed building designed in 1880 by Victorian architect Alfred Waterhouse and located in the Hampstead suburb of northern London. The space was revamped as a recording facility and opened for business in December 1992. AIR Lyndhurst is now a key London facility for classical and popular recordings, as well as film scores, television post-production, and dialogue, sound effects and music for video games. ^ Hastie, Paul (2014-03-27). "BBC News - Why do the children of Montserrat sing about a volcano?". BBC. Retrieved 2014-07-25.